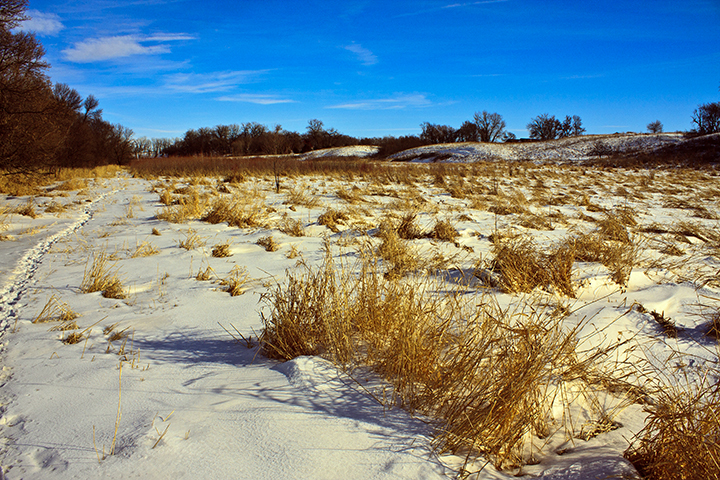 It was warm(ish) and mostly sunny when I arrived at the North Unit of Hastings Sand Coulee SNA on Saturday. 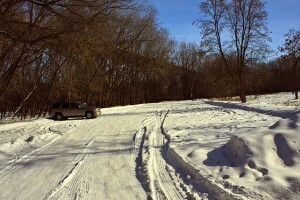 Directions on the Minnesota DNR Web page for this site say “Park at the stormwater utility”. I parked at the curb across the street, not wanting to block the narrow utility road. There is a padlocked gate across the utility road. The gate, the padlock and chain, and the nearby interpretive sign all look new. 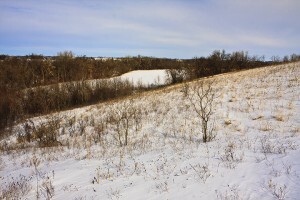 This unit of Hastings Sand Coulee SNA was acquired in 2011, 80 acres from a private owner, 25 acres from the City of Hastings, and a transfer of 80 acres from adjacent Hastings WMA. 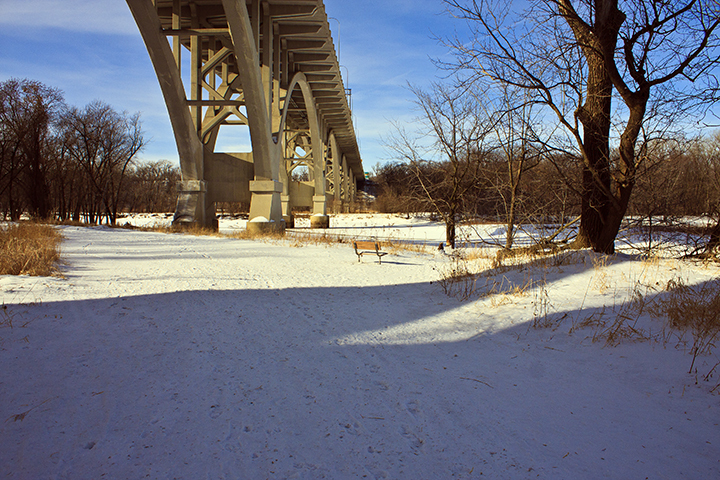 The Friends of the Mississippi River (FMR) has done considerable work restoring this site. 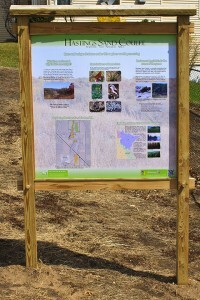 This is especially apparent on the eastern slope, the area designated Dry Sand – Gravel Prairie (Southern) (see page 4, native plant communities (NPCs), of the North and Center Units map at MinnesotaSeasons.com). 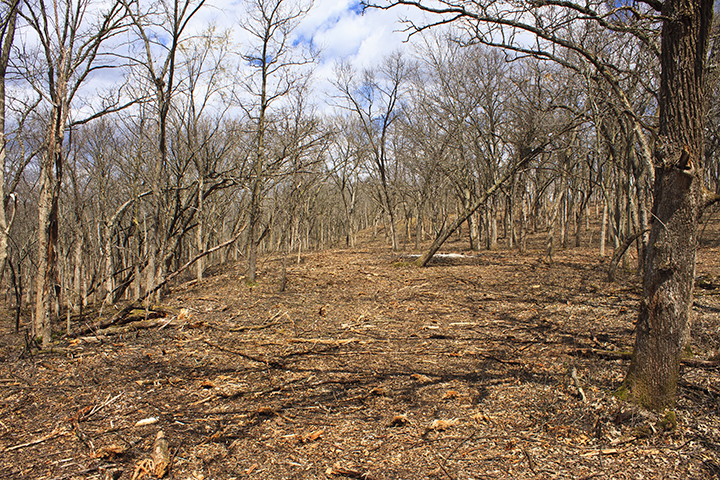 Following decades of fire suppression, what had once been a hill prairie has become bur oak woodland. 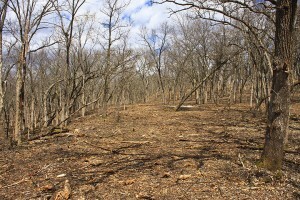 Most of the shrub layer in this section has been removed recently, leaving many small stumps and several large circles of ash. 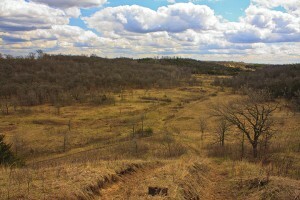 I hiked the perimeter of the south section then followed the eastern slope to the northern boundary. There is a gated entrance on Nicolai Avenue (County Road 91) but no place to park. On the northern boundary there is a metal folding chair in front of a tree overlooking the long valley below. The chair is slightly rusted. It looks like it has spent only one winter here. This is a good spot to stop for a while to look and listen for birds. 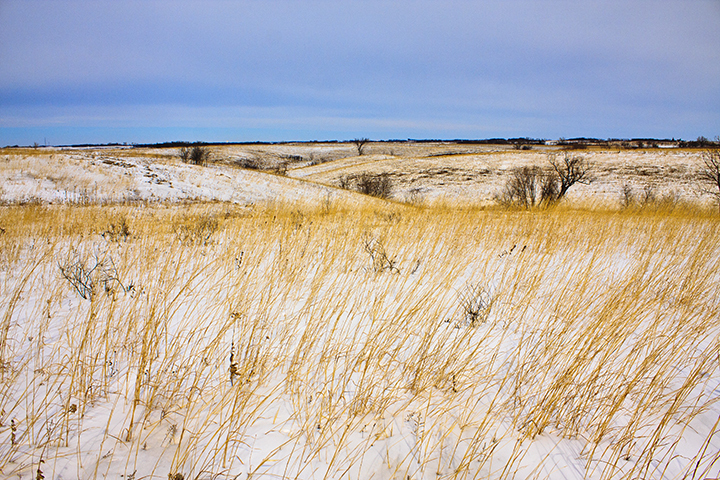 Continuing west, I started up the east-facing slope, the area labeled Dry Barrens Prairie (Southern) on the NPC map. It was here that I saw the first blooming wildflowers of this trip and of this season. It was a scattering of Dutchman’s breeches (Dicentra cucullaria) with small, greenish-white, immature flowers. Ascending the slope the flowers became progressively larger. 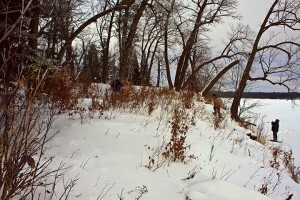 Those at the top of the slope were white and fully formed. 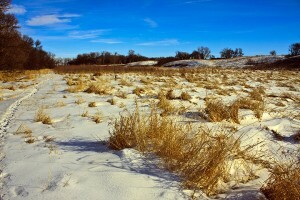 West of the coulee is a bare field. 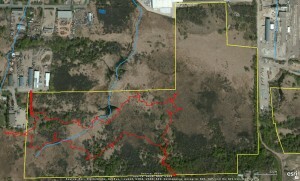 It appears to have been recently burned, probably in the fall since no charred vegetation is visible. Heading south I flushed an American Woodcock and saw the first dragonfly of the season, a common green darner. 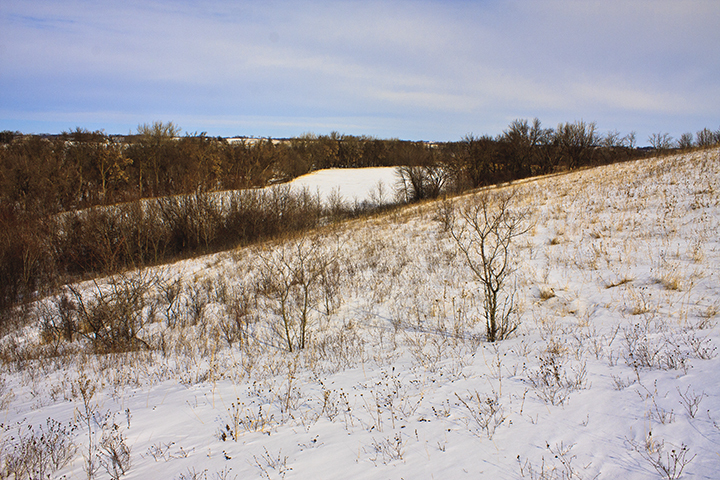 A sandy draw about 230 yards south of the north boundary leads to the valley below. Half way down this draw there is a large patch of Carolina thimbleweed (Anemone caroliniana), also called Carolina anemone. All of the flowers were white and most were at least partially open. Pennsylvania sedge (Carex pensylvanica), also blooming, was mixed with the Carolina thimbleweed. 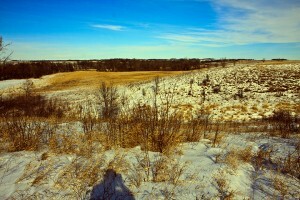 There is a small cemetery overlooking the coulee. 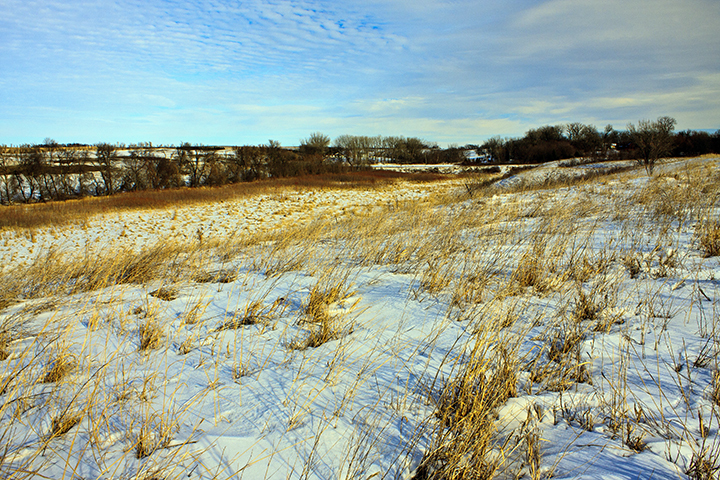 A sandy draw near the south end of the cemetery leads into the coulee in the south section. The slope east of the draw is covered with western androsace (Androsace occidentalis), also called western rock-jasmine. White flowers on many of the plants were visible but not open. 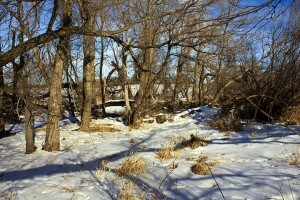 The draw leads to a drainage pond on what was formerly City of Hastings property. The pond is completely dry. Other birds spotted on this trip, along with the American Woodcock, include a Broad-winged Hawk, a Red-tailed Hawk, a Wild Turkey, an Eastern Bluebird, and thirteen other bird species. 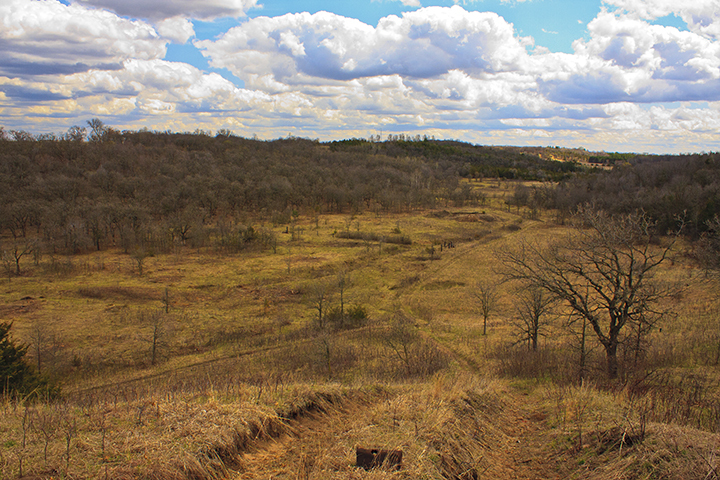 This entry was posted in Trips and tagged Hastings Sand Coulee SNA on May 6, 2014 by John Valo. The first warm(ish) weather of 2014 called to me and I answered the call. 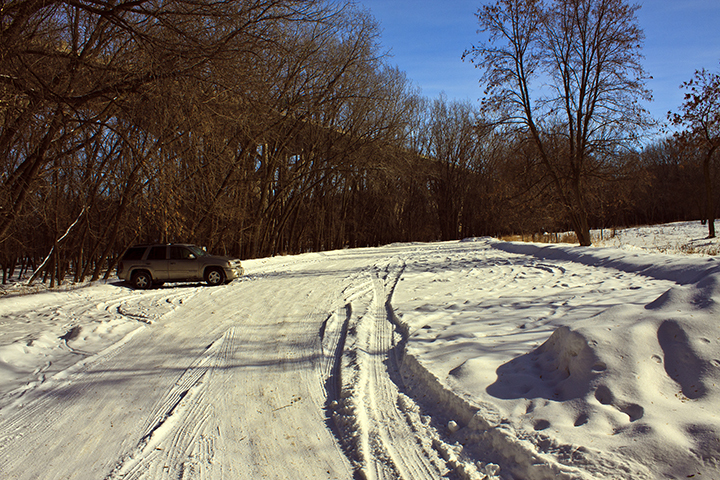 I threw the snowshoes in the back of the Trailblazer and headed to the newly expanded West Unit of Savage Fen SNA. I parked near the wood SNA sign, put on the snowshoes, and walked the 130 yards to the information kiosk. Just then the sun came out from behind a thin but dense layer of clouds. 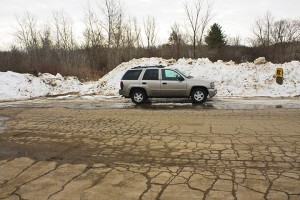 I realized I did not bring my sunglasses so I went back to the Trailblazer and got them. By the time I got back to photograph the kiosk area the sun was once again hidden behind the clouds. That was the only sun I was to see all day. The kiosk area has a few well developed eastern redcedar trees. 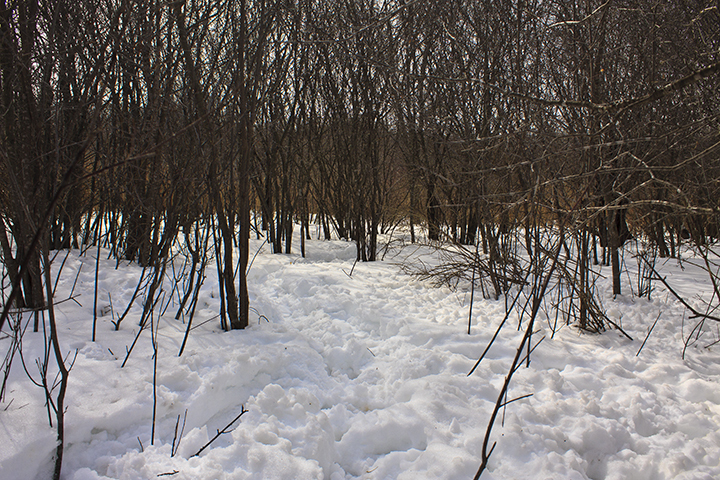 Packed snow and droppings beneath the trees indicate that this area is popular with whitetail deer. 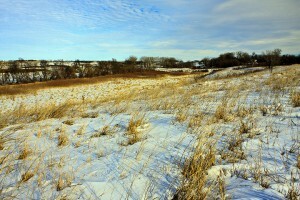 As I scanned the area I caught sight of movement near the south edge of the clearing. 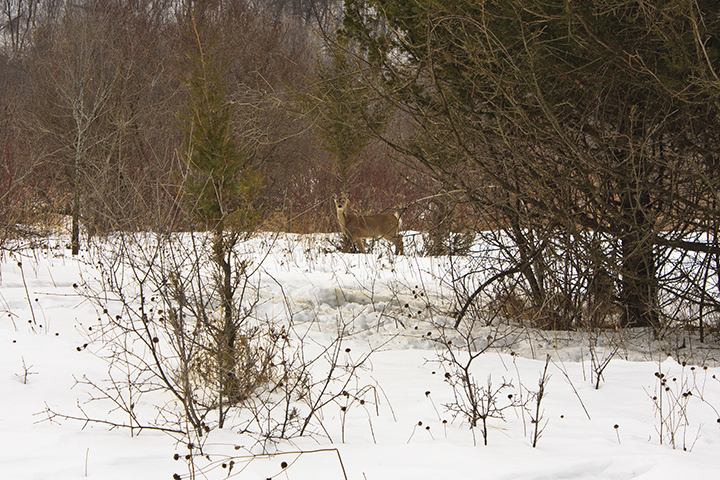 A deer approached the open area unaware of my presence. 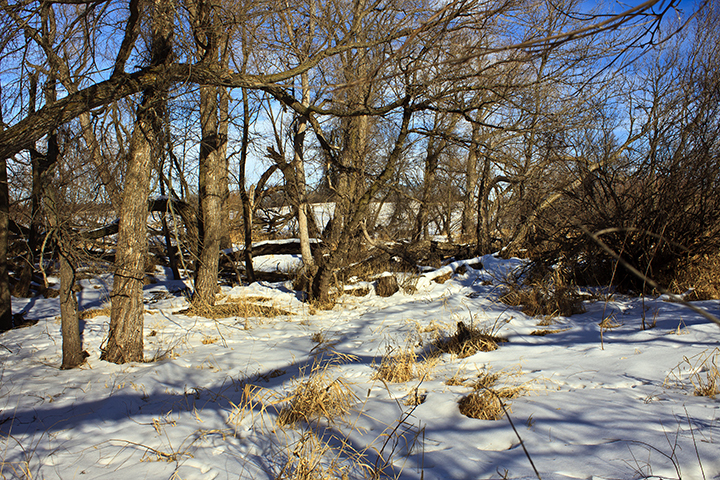 I managed to get the camera out without alerting the deer and took a couple of photos. Unfortunately, the only lens I brought was an 18-55mm wide angle zoom lens. This lens is good for landscapes but not for bringing distant objects closer. After a minute the deer saw me and bounded away. 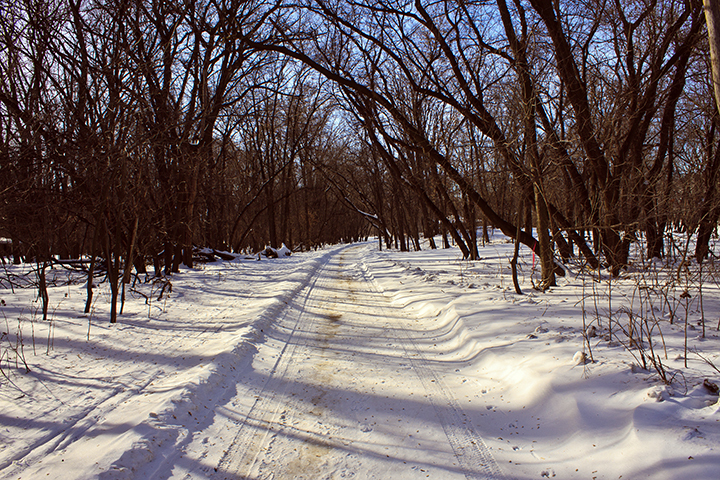 There were several deer trails to choose from leaving the kiosk area. I chose one leading south and then west. Before long I realized that the trail took me off of the SNA and I doubled back. 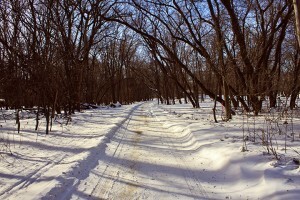 I headed east following many deer trails showing little to moderate – but some – usage. Hard packed snow beneath the more recently fallen snow helps to support the weight of a person on snowshoes. It reduces by close to 50% (my unscientific estimate) the effort required for each and every step. 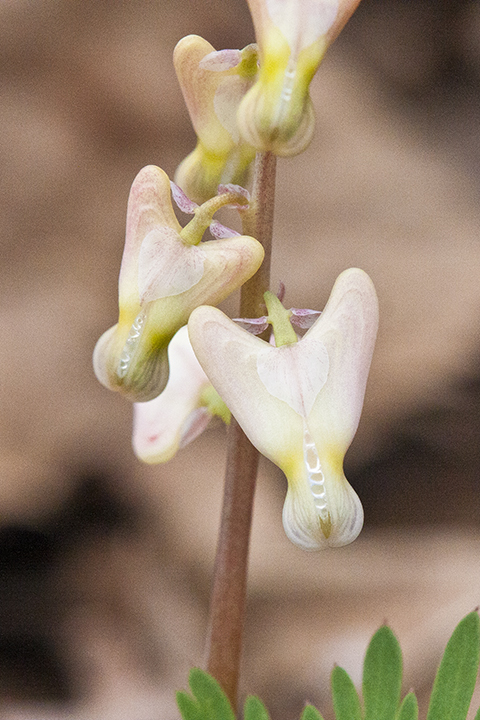 In the almost circular calcareous fen near the middle of the SNA I came across something I had never seen before. 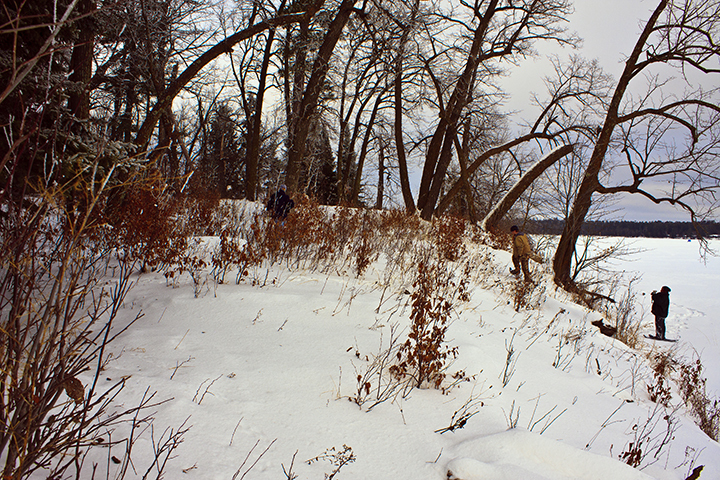 On the left (north) side of the deer trail the snow was 16″ deep and loose. 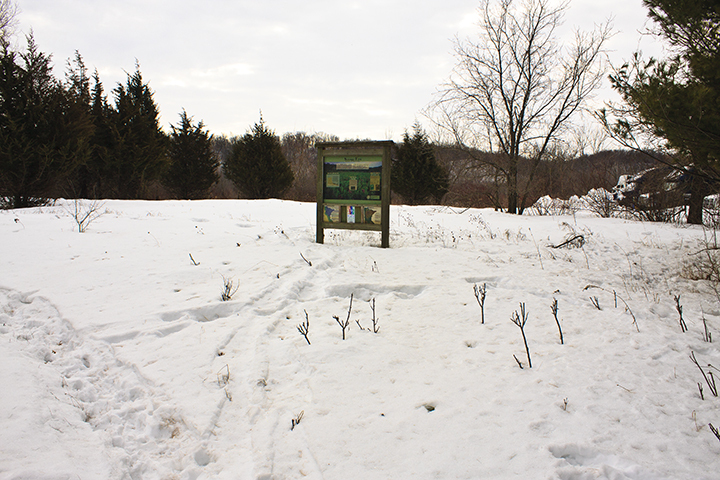 On the right (south) side of the trail was an irregular shelf of yellowish ice rising 6″ to 8″ above the snow with little snow covering it. I tested the ice with my pole and it was thick and solid. 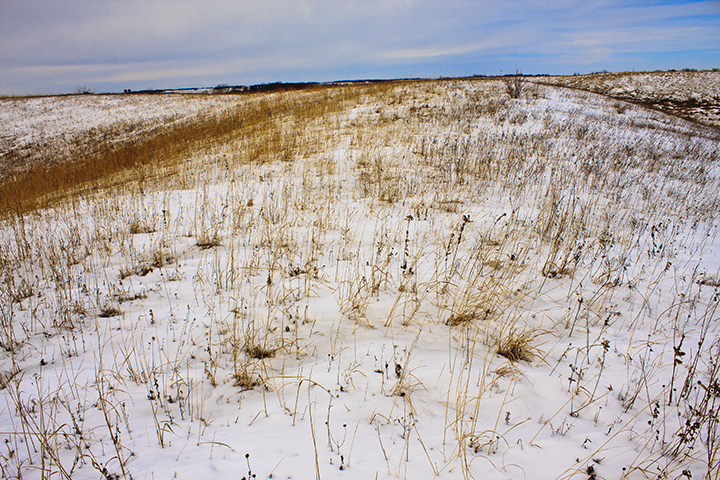 A little farther on I came across another ice shelf, this one 8″ to 12″ above the snow with no snow covering it. A small area, no more than the size of a peanut butter jar lid, had visibly flowing water on top of the ice – a spring! The slow but continuous flow of water explains the irregular surface of the ice shelf. 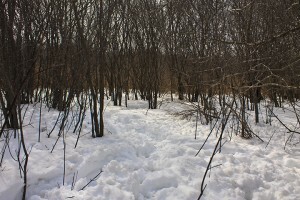 If a person falls in a ravine while wearing snowshoes and finds their legs and head in the air and their rump in the ravine, they will need to come up with a strategy to get themselves back on their feet. I’m just saying. 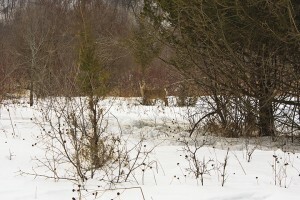 Along with the one whitetail deer I saw several American Crows, two Wild Turkeys, and a hawk I was unable to identify. I heard Northern Cardinals, Black-capped Chickadees, Blue Jays, a Northern/Yellow-shafted Flicker (don’t get me started), and a Mourning Dove. 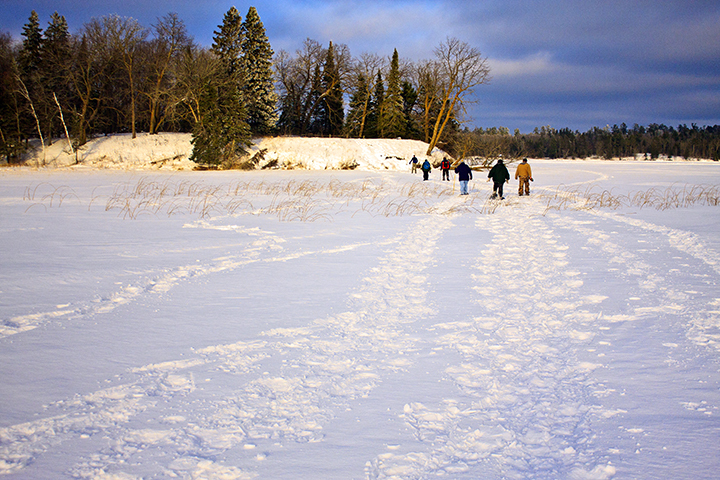 Total snowshoeing was 2.7 miles and 3 hours and 45 minutes. The high temperature in Savage today was 46°. 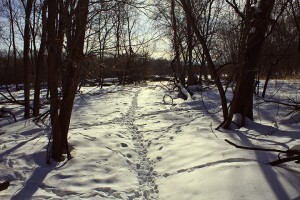 By the end of the trek the snow on top was the consistency of wet sugar – heavy but still granular. 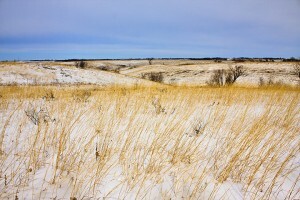 This entry was posted in Trips and tagged Savage Fen SNA on March 10, 2014 by John Valo. 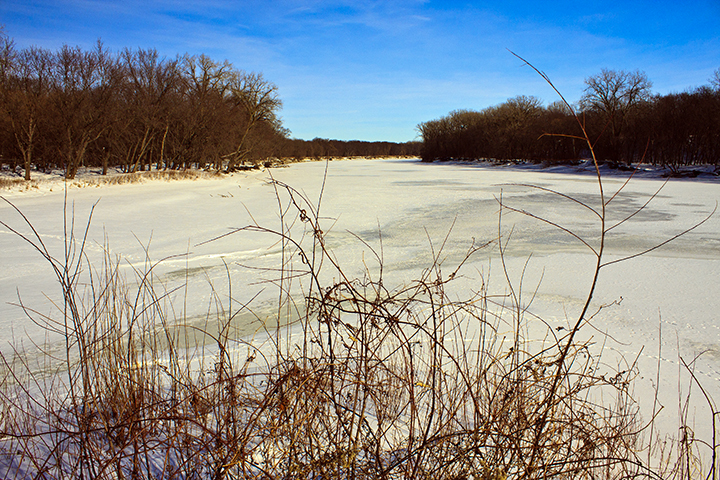 It was 38° and partly sunny when I arrived at Des Moines River SNA at noon on Tuesday. The warm front the day before brought three inches of fresh snow. 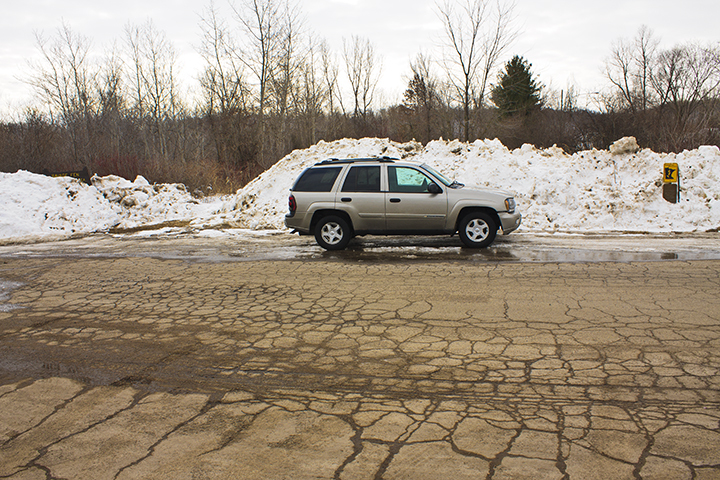 Mine were the first tire tracks in the parking area at Christianna Bridge Public Water Access. I strapped on the snowshoes and headed up the hill to the southwest corner of the SNA. A Red-bellied Woodpecker complained until I was out of site, repeating its rolling, one-second long churr every few seconds. 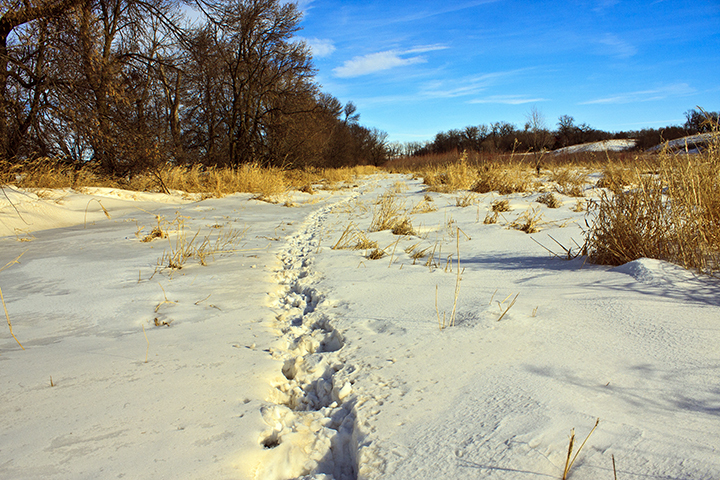 At the SNA boundary marker there were fresh Red Fox tracks on top of yesterday’s snow. 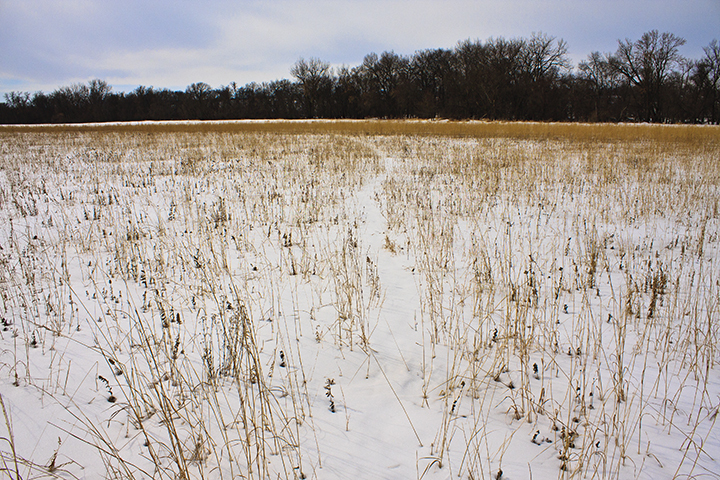 A single line of tracks meandered east, following the fence line that forms the SNA boundary. 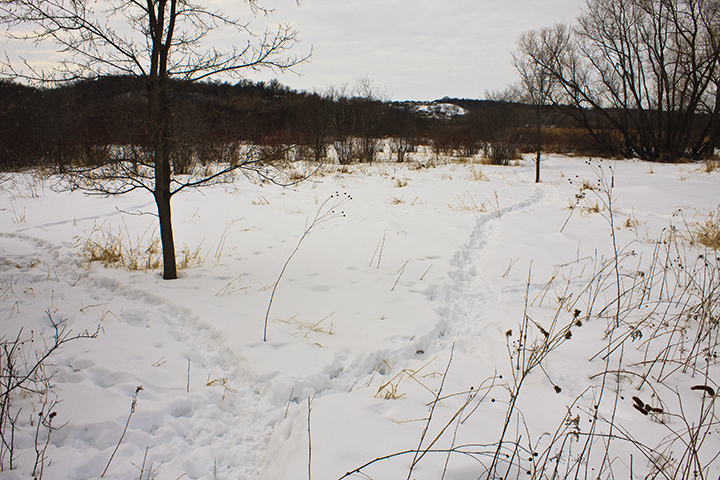 At one point there was a jumble of many tracks around a small, jagged, mostly filled in hole. The fox apparently dug for and possibly found a vole or mouse. I continued east following the SNA boundary. With each step my snowshoes sank twelve to eighteen inches into the snow. I had to lift my knees high with each step to avoid dragging the toe of the snowshoe through the snow at the lead edge of the shoe print. At this rate I knew that if I would be worn out soon unless something changed. 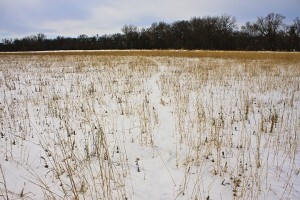 I began searching for sign of a deer path. 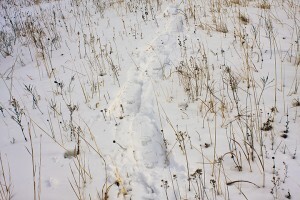 There were no fresh tracks in sight, but I soon found a path buried under the snow. 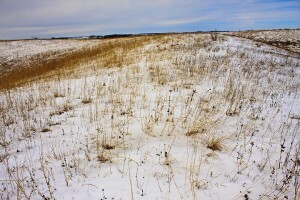 It appeared as a somewhat straight line where a little less grass protruded from the snow. 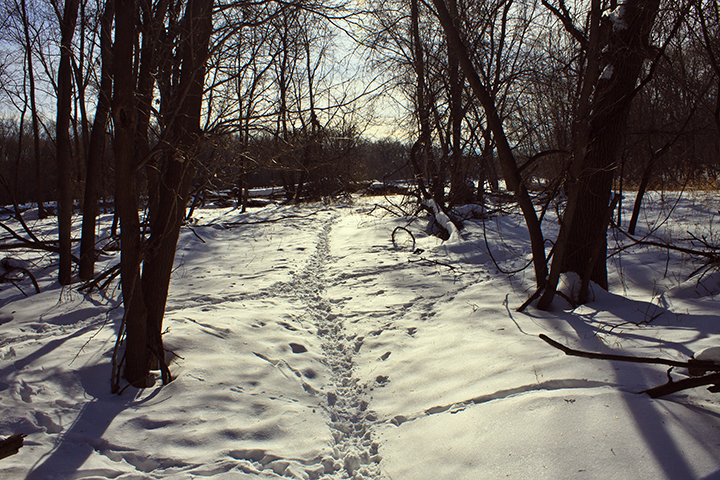 I stepped onto the path and the snow held my weight. For the next two hours I explored the south half of the SNA. 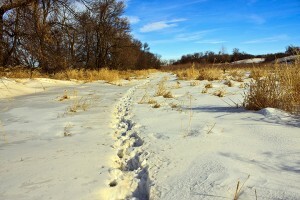 I walked on deer paths where they were available but they seldom went where I did. 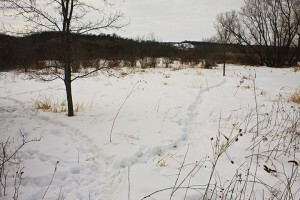 Other sightings this day include four whitetail deer, several Black-capped Chickadees, about thirty LBJs (Little Brown Jobs—unidentified sparrows), and the tracks of a Ring-necked Pheasant. 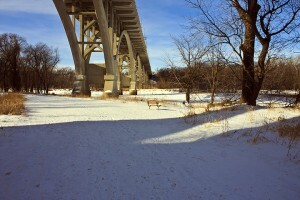 This entry was posted in Trips on February 20, 2014 by John Valo.